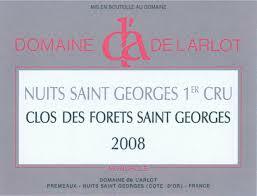 2014 Domaine de L'Arlot Nuits St Georges Clos Des Forets Saint Georges - $96.00: Vins Rare, The finest selection of rare wines. There is a discreet but not invisible application of wood surrounding the intensely floral and notably gamy dark berry fruit suffused nose. There is both good volume and much better mid-palate concentration to the broad-shouldered flavors where the abundant dry extract does a fine job of buffering the firm and slightly rustic tannins that impart a dusty texture to the impressively complex and persistent finish. This should be excellent if you have the patience to wait. Burghound 92 Outstanding!